The first purpose of this experiment was to determine the effect of temperature on the growth rate of bacteria in meat. The second purpose of this experiment was to determine the effect of temperature on the types of bacteria that grow in meat. I became interested in this idea when my mom would thaw out the meat in the sink then leave it there until we cooked it. I wondered how long it took the meat to spoil in different temperatures. The information gained from this experiment could help homemakers and the food service industry protect people from food poisoning. Hospitals, schools, and restaurants would all benefit. My first hypothesis was that the most bacteria would grow in the temperatures between 21° and 37° Celsius. My second hypothesis was that the four main types of bacteria that would grow were Staphylococcus aureus, Salmonella enteriditis, Escherichia coli O157:H7, and Campylobacter. The second manipulated variable was the types of meat used. The first responding variable was the amount of bacteria in the meat after storage. The second responding variable was the type of bacteria that grew after storage. 5. Prepare the sterile knife, grinder and scissors. 6. Cut one square inch meat out with sterile knife. 7. Cut meat into one square cm pieces and place in sterile grinder. 15. Take one slurry and add 10 micro L onto blood agar. 16. Return slurry to storage temperature. 17. Spread with loop and place in incubator at time zero. 19. Repeat steps 5 through 18 with each type of meat. 20. At hour 12 repeat steps 15 though 18. 23. Count colonies with unaided eye under a white light and record. The original first purpose of this experiment was to determine the effect of temperature on the growth rate of bacteria in meat. The results of the experiment were that Hamburger had the most bacteria at 0 hours and chicken had the least. Freezing all of the meats was more effective in limiting the growth rate of bacteria than storing the meats in any of the other temperatures. All meats grew the most in the 37 degree temperature at 48 hours and the least in 0 degrees centigrade temperature. Pork had on average about 13 bacteria colonies at freezing temperature, 135 colonies at refrigeration temperature, 6000 colonies at room temperature, and 7563 colonies at body temperature. The types of bacteria on the meat were Aeromonas, Hydrophilia, Serratia, Non fermenting GNR, Serratia plymothica, and Staph Coagulant. Chicken had, on average, about 13 bacteria colonies at freezing temperature, 27 colonies at refrigeration temperature, 1200 colonies at room temperature, and 4600 colonies at body temperature. Overall, the chicken had the least amount of bacteria colonies. The types of bacteria were Bacillus, Diptheroids-Skin flora, Staph Coagulent, and Escherichia Coli. 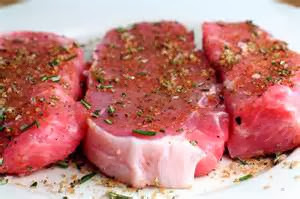 Steak had, on average, about 90 bacteria colonies at freezing temperature, 260 colonies at refrigeration temperature, 9000 colonies at room temperature, and 9875 colonies at body temperature. The types of bacteria were Diphtherioids/Cat P, enterococci/Cat WR, Micro Coccus, and Serratia. Hamburger had about 852 bacteria colonies at freezing temperature, 7275 colonies in refrigeration temperature, 12,125 colonies at room temperature, and 14,000 colonies at body temperature. Overall, Hamburger grew the most bacteria in any temperature. The types of bacteria were Micro coccus, Enterococci, Streptococcus ap, Serratia sp, Enterobacter cloacae, and Acinetobacter baumanii. My first hypothesis was that the most bacteria would grow in the temperatures between 21° and 37° Celsius. The results indicate that my first hypothesis should be accepted. All the meats grew at a steady rate and had the most growth at 37°. My second hypothesis was that the four main types of bacteria that would grow were Staphylococcus aureus, Salmonella enteriditis, Escherichia coli O157:H7, and Campylobacter.The results indicate that my second hypothesis was partially correct. We did find campylobacter, staphlylococcus and a strain of Escherichia coli but not Escherichia coli 0157:H7 or Salmonella. I rejected this hypothesis. After thinking about the results of this experiment, I wonder what would happen if I did my procedures again with cooked meat. Would the bacteria content be completely different? Would we still find pathogenic bacteria? If I were to conduct this project again I would make sure all my meats had the exact same “pull” dates. Also when I counted my bacteria colonies I would make sure I had more exact numbers instead of some estimations. I would use a more exact counting system for that, perhaps a microscope with a millimeter grid.